Good morning! This is a great day for UB. And it’s a great day for all of our communities—starting here in downtown Buffalo, and across our region and state. We are thrilled to share this moment with so many partners and friends from our elected officials, civic leaders and community members, to our higher education community, and our partners in health care, research, business and industry. As Dr. Cain said, we have many people to thank. I want to take a moment to recognize a few honored guests, including New York State Governor Andrew Cuomo, Lieutenant Governor Bob Duffy, SUNY Trustee Eunice Lewin, SUNY Chancellor Nancy Zimpher, Members of the University at Buffalo Council, Members of the UB Foundation, including its Chair Francis Letro, and members of the Western New York legislative delegation. We are also pleased to be joined today by the Strategic Implementation Assessment Team of the Governor’s Regional Economic Development Council. This is a critical milestone toward realizing our UB 2020 vision—a vision for establishing UB among the ranks of the world’s great research universities. And of course, the historic New York SUNY 2020 legislation signed by Governor Cuomo, and the related challenge grant UB received, have helped to advance many key elements of the UB 2020 vision—particularly our plans to move the medical school downtown. 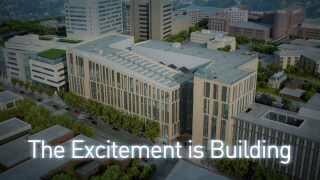 This site puts the medical school at the heart of our expanding downtown campus, the center of the region's biosciences corridor, and just a short walk away from hospitals and life sciences research partners. Moving the medical school downtown connects us more closely to all our surrounding communities. It also connects our distinguished past with our bright future. Enhancing the quality of life of our communities has always been a core aspect of UB’s mission—from our origins as a small private medical school to this moment we celebrate today, as we break ground for our new medical school building. We’ve been waiting for this day. The excitement has been building across our communities. And today, it is taking tangible shape. This is a defining moment for UB, for Buffalo, and for New York State. And we know that the impact of this progress extends far beyond the region. The students we educate, and the discoveries and treatments generated here, will save lives and improve the quality of life for people around the world. But we don’t do any of this alone. Achieving this vision is a collaborative effort. Simply put, we are here today because of all of you. Thank you all for being here to help us take this giant next step for our medical school, for our university, and for all those we serve across our region, state, nation, and world.